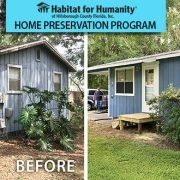 Through the support of our generous partners and volunteers, Habitat Hillsborough’s Home Preservation Program (HPP) provides exterior restoration services to low-income Hillsborough County homeowners. In addition to volunteer labor, our partners provide materials and services at a fraction of the cost to the homeowners. From HPP’s inception, one of our most enthusiastic partners has been Thrivent Financial through its “Thrivent Builds” program. 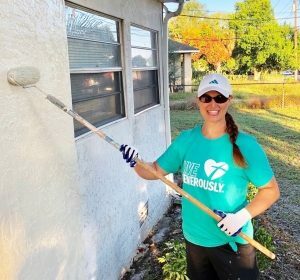 Last year alone, Thrivent completed five volunteer projects with Habitat Hillsborough and contributed a total of $12,500 to support HPP. 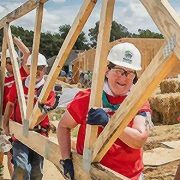 Thrivent Financial has been a friend and valued partner to Habitat for Humanity International for more than a decade. 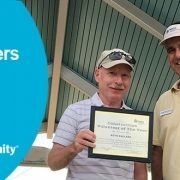 On a local level, we at Habitat Hillsborough are extremely grateful for our partnership with Thrivent Financial and look forward to many more years of good works. 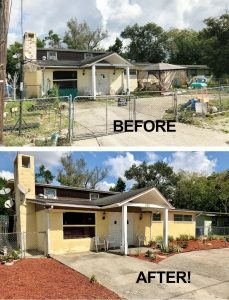 The typical HPP projects Thrivent assists with include painting, debris removal, yard clean-up and landscaping – often in collaboration with other partners. For example, last Thanksgiving, volunteers from Thrivent teamed up with us for a massive debris removal and clean-up of the Lewis family property. Once the Thrivent volunteers had everything cleaned up, we installed new plants and mulch to give the home some much needed curb appeal. A few days later, MDS Painting reached out to Habitat to offer their services over the Thanksgiving holiday weekend to a homeowner in need and Mrs. Lewis’ home fit the scope of work perfectly! MDS provided professional exterior repairs and painting for the home. The work that was completed enables the family to continue to live securely and independently in their home for years to come. A huge thanks to our friends at Thrivent Financial and MDS Painting! We are looking forward to another productive year! NOTE: Our current focus for HPP activities is exclusively in the USF/Temple Terrace area. 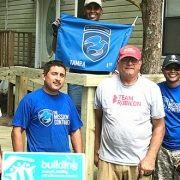 For over a decade, Thrivent Financial has partnered with Habitat International to build safe, affordable homes in partnership with those living in poor housing conditions both in the United States and around the world through the Thrivent Builds program. 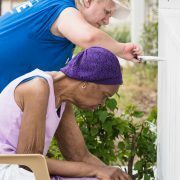 The partnership blends the financial, volunteer and advocacy resources of Thrivent Financial and its members with the hands-on, global experiences of Habitat. 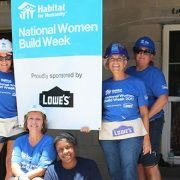 Habitat's Home Preservation repairs, replaces and rejuvenates local homeowner properties.